An important conclusion one can draw from a recent article in The Wall Street Journal is that companies need to help protect the health of their frequent flyers. Studies show that stress, disrupted sleep schedules, and restaurant food all contribute to weight gain, so employees who are frequently on the road hardly stand a chance. In fact, workers who spend three weeks or more out of every month traveling are 92% more likely to be obese than light travelers. And obese employees – as we all well know – pose a serious financial risk to the employer. Luckily, many hotels and airports are offering amenities to enhance the travel experience and increase opportunities for fitness away from home. Chicago’s O’hare and Boston’s Logan airport both offer gym access to jetsetters with spare time, but for the most part, exercise facilities are still a rare find on the road. Better options usually appear once travelers reach their hotel. Westin is now offering New Balance running shoes and workout attire to guests free of charge to encourage healthy habits. 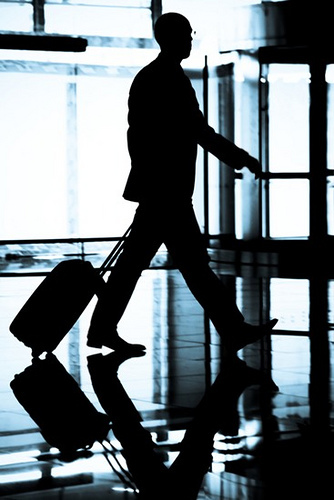 If you or a loved one travels for work – take note: as little as 15 minutes of exercise per day can significantly decrease health risks associated with weight gain. The biggest issue for many, though, is the lack of routine. When we’re at home it’s easy to establish a set schedule with time for meal prep and physical activity. On the road, however, we are at the mercy of fate and erratic schedules. Flight delays, rental car issues, and business functions make up an environment where the traveler is not in control of the situation. Even a mindful eater and conscientious exerciser at home can fall victim to what presents itself when cruising at 35,000 feet or noshing at rest stops off the highway. As The Journal puts it: “Being a road warrior can be good for your career but bad for your health”. Employers need to recognize the risks employees face and either minimize travel (take advantage of available technology and reduce in-person appearances) or pay particular attention to the health of these employees. Healthy workers should be both a personal and a professional priority. I always try to bring healthy snacks with me when I travel for work (almonds, dried fruit etc.) and it helps avoid excessive snacking and big, unhealthy meals out. Thanks to posts such as this, there is more awareness for traveling sales people now than was the case decades ago.